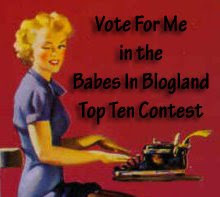 KImberley has a webring with over 20 blogs, so she thought it would be fun to have a contest to determine the top 10. I am fortunate to be considered in the running, so if you like what you have read here and would like to vote for me please click on this blog title and it will link you to Kimberley's blog (where you just click to vote). I also want to thank everyone for your visits and comments. It is amazing to meet gifted and talented people from all over the world. I love the community that is being built and seeing your faces on other blogs that I visit. I voted for you ... good luck! Thanks Sharon, I've always wanted to be on a Top 10 List and seeing as Top 10 Richest People is eluding me I'd be happy with this.